Catecholamines have both anti-inflammatory and vasoactive properties. A decreased cardiac response to catecholamines has been associated with a high risk of death in sepsis and septic shock. The aim of this study was to investigate the effects of epinephrine (EPI) on heart rate variability and autonomic balance, as well as cytokine levels, in a rat sepsis model. Thirty-six male Sprague-Dawley rats were assigned to 4 experimental groups and 2 control groups of 6 rats each. 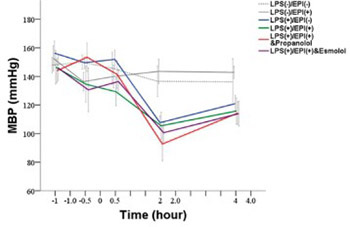 The rats in the experimental groups were inoculated with a lipopolysaccharide (LPS, endotoxin) to establish a sepsis model. Group A received only LPS; group B received LPS, antecedent EPI and the nonselective beta-blocker propranolol; group C received LPS and antecedent EPI; and group D received LPS, antecedent EPI and the selective beta1-blocker esmolol. One control group received EPI and the other received saline placebo. Heart rate variability was analyzed and tumor necrosis factor-α (TNF-α), interleukin-6 (IL-6) and interleukin-1β (IL-1β) levels were measured. Measurements were carried out at baseline and 0, 0.5, 2, and 4 hours after LPS inoculation. There were significant differences in heart rate variability and cytokine levels between the groups, indicating that LPS infusion caused autonomic imbalance. Antecedent EPI significantly decreased the level of TNF-α in group C compared with group A in which TNF-α level peaked at 2 hours and then declined. Propranolol (group B) but not esmolol (group D) administration resulted in elevated TNF-α levels, comparable to those observed in group A. In conclusion, antecedent administration of EPI in a rat sepsis model inhibits the production of TNF-α possibly via the β2-adrenoreceptor. Vida G, Peña G, Kanashiro A, Palange D, Deitch EA, Ulloa L et al. β2-adrenoreceptors of regulatory lymphocytes are essential for vagal neuromodulation of the innate immune system. FASEB J 2011; 25:4476-4485. Chang YT, Wann SR, Hsieh KH, Liu YC, Chang CH, Huang MS, et al. The effects of lazaroid U-74389G in a rat sepsis model. Inflamm Res 2011; 60:29-35. Nardocci G, Martin A, Abarzúa S, Rodríguez J, Simon F, Reyes EP, et al. Sepsis progression to multiple organ dysfunction in carotid chemo/baro-denervated rats treated with lipopolysaccharide. J Neuroimmunol 2015; 278:44-52. Levy B, Dusang B, Annane D, Gibot S, Bollaert PE, College Interregional des Réanimateurs du Nord-Est. College Interregional des Réanimateurs du Nord-Est: Cardiovascular response to dopamine and early prediction of outcome in septic shock: a prospective multiple-center study. Crit Care Med 2005; 33:2172-2177. Munford RS, Pugin J. Normal responses to injury prevent systemic inflammation and can be immunosuppressive. Am J Respir Crit Care Med 2001; 163:316-321. Norris PR, Ozdas A, Cao H, Williams AE, Harrell FE, Jenkins JM, et al. Cardiac uncoupling and heart rate variability stratify ICU patients by mortality: a study of 2088 trauma patients. Ann Surg 2006; 243:804-814. Thayer JF, Sternberg E. Beyond heart rate variability: vagal regulation of allostatic systems. Ann N Y Acad Sci 2006; 1088:361-372. Walker-Brown J, Roberts MR. Differential contribution of beta-adrenergic receptors expressed on radiosensitive versus radioresistant cells to protection against inflammation and mortality in murine endotoxemia. Shock 2009; 320:541-547. Wang Y, Yu X, Wang F, Wang Y, Wang Y, Li H, et al. Yohimbine promotes cardiac NE release and prevents LPS-induced cardiac dysfunction via blockade of presynaptic α2A-adrenergic receptor. PLoS One 2013; 8:e63622. Roul D, Rozec B, André G. Increased β2-adrenergic vasorelaxation at the early phase of endotoxemic shock in rats. Vascul Pharmacol 2015; 72:181-189.
van der Poll T, Levi M, Dentener M, Jansen PM, Coyle SM, Braxton CC, et al. Epinephrine exerts anticoagulant effects during human endotoxemia. J Exp Med 1997; 185:1143-1148. Jan BU, Coyle SM, Oikawa LO, Lu SE, Calvano SE, Lehrer PM, et al. Influence of acute epinephrine infusion on endotoxin-induced parameters of heart rate variability: a randomized controlled trial. Ann Surg 2009; 249:750-756.
von Haehling S, Genth-Zotz S, Bolger AP, Kalra PR, Kemp M, Adcock IM, et al. Effect of noradrenaline and isoproterenol on lipopolysaccharide-induced tumor necrosis factor-alpha production in whole blood from patients with chronic heart failure and the role of beta-adrenergic receptors. Am J Cardiol 2005; 95:885-889. Van der Poll T, Lowry SF. Epinephrine inhibits endotoxin-induced IL-1 beta production: roles of tumor necrosis factor-alpha and IL-10. Am J Physiol 1997; 273:1885-1890. Sun S, Weil MH, Tang W, Kamohara T, Klouche K. Delta-opioid receptor agonist reduces severity of postresuscitation myocardial dysfunction. Am J Physiol Heart Circ Physiol 2004; 287:H969-974. Buchman TG, Stein PK, Goldstein B. Heart rate variability in critical illness and critical care. Curr Opin Crit Care 2002; 8:311-315. Berntson GG, Bigger JT Jr, Eckberg DL, Grossman P, Kaufmann PG, Malik M, et al. Heart rate variability: origins, methods, and interpretive caveats. Psychophysiology 1997; 34:623-648. Alvarez SM, Katsamanis Karavidas M, Coyle SM. Low-dose steroid alters in vivo endotoxininduced systemic inflammation but does not influence autonomic dysfunction. J Endotoxin Res 2007; 13:358-368. Cooley JW TJ. An algorithm for machine calculation of complex Fourier series. Math Comput 1965; 19:297-301. Lin E, Katz JA, Calvano SE, Coyle SM, Randhawa S, Shahin I, et al. The influence of human endotoxemia on CD95-induced apoptosis. Arch Surg 1998; 133:1322-1327. Godin PJ, Fleisher LA, Eidsath A, Vandivier RW, Preas HL, Banks SM, et al. Experimental human endotoxemia increases cardiac regularity: results from a prospective, randomized, crossover trial. Crit Care Med 1996; 24:1117–1124. Borovikova LV, Ivanova S, Zhang M, Yang H, Botchkina GI, Watkins LR, et al. Vagus nerve stimulation attenuates the systemic inflammatory response to endotoxin. Nature 2000; 405:458-462. Goldstein B, Kempski MH, Stair D, Tipton RB, DeKing D, DeLong DJ, et al. Autonomic modulation of heart rate variability during endotoxin shock in rabbits. Crit Care Med 1995; 23:1694-1702. Huang J, Wang Y, Jiang D, Zhou J, Huang X. The sympathetic-vagal balance against endotoxemia. J Neural Transm 2010; 117:729-735. Ciesieiczyk K, Furgata A, Dobrek L, Juszczak K, Thor P. Altered sympathovagal balance and pain hypersensitivity in TNBS-induced colitis. Arch Med Sci 2017; 13:246-255. Piotrowicz E, Buchner T, Piotrowski W, Piotrowicz R. Influence of home-based telemonitored Nordic walking training on autonomic nervous system balance in heart failure patients. Arch Med Sci 2015; 11:1205-1212. Meuwly C, Chowdhury T, Gelpi R, Erne P, Schaller B. The Trigemino-cardiac Reflex: Is Treatment with Atropine Still Justified? J Neurosurg Anesthesiol 2017; 29:372-373 [letter]. Van der Poll T, Jansen J, Endert E, Sauerwein HP, van Deventer SJ. Noradrenaline inhibits lipopolysaccharide-induced tumor necrosis factor and interleukin 6 production in human whole blood. Infect Immun 1994; 62:2046–2050. Lowry SF. Human endotoxemia: a model for mechanistic insight and therapeutic targeting. Shock 2005; 24:94-100. Van der Poll T, Coyle SM, Barbosa K, Braxton CC, Lowry SF. Epinephrine inhibits tumor necrosis factor-alpha and potentiates interleukin 10 production during human endotoxemia. J Clin Invest 1996; 97:713-719. Guirao X, Kumar A, Katz J, Smith M, Lin E, Keogh C, et al. Catecholamines increase monocyte TNF receptors and inhibit TNF through beta 2-adrenoreceptor activation. Am J Physiol 1997; 273:1203-1208. Nahmias C, Blin N, Elalouf JM, Mattei MG, Strosberg AD, Emorine LJ. Molecular characterization of the mouse beta 3-adrenergic receptor: relationship with the atypical receptor of adipocytes. EMBO J. 1991; 10:3721–3727. Osborn TM, Tracy JK, Dunne JR, Pasquale M, Napolitano LM. Epidemiology of sepsis in patients with traumatic injury. Crit Care Med 2004; 32:2234-2240. Ristagno G, Tang W, Huang L, Fymat A, Chang YT, Sun S, et al. Epinephrine reduces cerebral perfusion during cardiopulmonary resuscitation. Crit Care Med 2009; 37:1408-1415. Barrett LK, Orie NN, Taylor V, Stidwell RP, Clapp LH, Singer M. Differential effects of vasopressin and norepinephrine on vascular reactivity in a long-term rodent model of sepsis. Crit Care Med 2007; 35:2337-2343. Liu W, Shan LP, Dong XS, Liu T, Ma T, Liu Z. Effect of early fluid resuscitation on the lung in a rat model of lipopolysaccharide-induced septic shock. Eur Rev Med Pharmacol Sci 2013; 17:161-169. Meyer BC, Werncke T, Foert E, Kruschewski M, Hopfenmüller W, Ribbe C, et al. Do the cardiovascular risk profile and the degree of arterial wall calcification influence the performance of MDCT angiography of lower extremity arteries? Eur Radiol 2010; 20:497-505.